Charlton boss Alan Curbishley says he will not let setbacks in the transfer market cause him to quit trying to add to his squad ahead of the new season. "We've been desperately working to bring players in who will make a difference to us. We are looking to strengthen in all positions," he said. "It has been difficult because the players we have been going for, other people have been looking at as well. "But we will keep going and vigorously try to bring some players in." Charlton have recently been linked with Southampton striker James Beattie - claims Curbishley said took him by surprise upon his return from the club's pre-season tour of China. "I came back to that. I am not quite sure how that came about," he said. "But the sort of names which have been banded about - why not? Though we will have to wait and see." 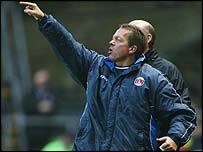 Meanwhile, Curbishley said he felt the trip to the Far East had been useful preparation for the 2004-05 campaign. "It was really hot and humid out there, which was what we expected," he said. "It was worthwhile commercially and we trained really hard out there. It was not a jolly-up or a holiday."